Join us at the Milwaukee Area Labor Council this Friday for a Get Out the Vote Rally, Phone Bank and Canvass with special guests Senator Elizabeth Warren, Senator Tammy Baldwin and Lieutenant Governor candidate Mandela Barnes. After the rally, join our Labor 2018 union family to knock doors and make phone calls to remind union members to get to the polls for candidates who will support our rights and wages. RSVP: Let us know you’re coming. RSVP by clicking here. The Labor 2018 program is firing on all cylinders as we head into the final days before election day on Tuesday, Nov. 6. We need all hands on deck to contact voters in the final days before Tuesday! Join union members as we fan out into neighborhoods across Wisconsin to have vital one-on-one conversations about our democracy, our rights and our voting power! Stop into one of our Get out the Vote locations and volunteer for a shift today. Click here for a flyer link for schedule. Madison Labor Temple, 1602 S Park St., Office Phone: 608-733-9258 Contact: Kim Moon, 608-733-9258, kim_moon@ibew.org or Elizabeth Trevino, 715-304-9807, etrevino@aflcio.org. On November 6, we have the opportunity to put an end to Scott Walker’s union-busting administration. Tony Evers is a lifelong educator who respects the rights of working people to collectively bargain. From teaching science in Baraboo to serving as statewide Superintendent of Wisconsin schools, Tony Evers has dedicated his life to ensuring Wisconsin kids get the best education possible. Tony Evers knows that unions are critical to the well-being of families in our state, providing living wages, quality health care, safe working conditions and job security. As governor, he will work hard to reverse Scott Walker's anti-labor agenda. It’s time to stand up for Wisconsin values. It’s time to head to the polls on November 6 for a better Wisconsin. It’s time to vote for a Wisconsin where the freedom of working people to stand together in a team and collectively bargain is preserved and respected. A Wisconsin where the economy is focused on helping middle-class and working-class families get ahead. Vote Tony Evers for Governor on November 6. Find more Wisconsin AFL-CIO endorsed candidates for your area and join our Labor 2018 volunteer team to contact voters ahead of Election Day. Giving Working People the Blues. Gov. Walker’s anti-union hits have struck a wrong chord with working families and created an economy that favors the elite over working people. Gov. Walker’s old tune of union-busting has attacked the freedom of Wisconsin workers to collectively bargaining and undermined our Wisconsin value of dignity for work. WARNING Walker’s Top 5 anti-union hits are anti-family content. This explicit content is inappropriate for working families of all ages. Walker’s off-key policies have failed to create jobs and economic opportunity. While Gov. Walker spins his job-killing record, Wisconsin’s middle class is shrinking and wages are stagnating. Time to change the channel. Keep Walker’s anti-union hits from climbing back up the charts. On November 6, vote for Tony Evers, our union-approved candidate who will do right by Wisconsin workers and our families. Former President Barack Obama is coming to Wisconsin! President Obama will help turn out the vote and energize voters ahead of the November 6 elections in support of worker friendly candidates like Senator Tammy Baldwin and Gubernatorial candidate Tony Evers. The Democratic Party of Wisconsin is hosting a special Get Out the Vote Rally with President Barack Obama in Milwaukee. Come hear from President Obama, Senator Tammy Baldwin, Tony Evers, and more. Date: Friday, October 26, Doors Open 12:30 p.m. The event is free and open to the public. Tickets are required for entry. It’s time to turn Wisconsin around for working families. We need every one to get out and vote in order to make a change this November. Don’t let your friends and family stay home on November 6. Wisconsin AFL-CIO endorsed candidates have pledged to support collective bargaining for a healthy middle class, make healthcare more affordable for families, protect workplace safety regulations and restore the rights of Wisconsin workers. Join Obama in Milwaukee as we rally to get out the vote in Wisconsin! U.S. Senator Tammy Baldwin has long been a friend of working people. In Congress, she stands up for Wisconsin workers, not for special interests. She has taken on big pharma and insurance companies to ensure working people have affordable health care and protect coverage for those with pre-existing conditions. Tammy has led efforts against unfair trade deals that ship good American jobs overseas. Baldwin has been an active participant in the NAFTA renegotiation process and favors a renewed deal that ends outsourcing, raises wages and creates jobs. She fights to protect Wisconsin manufacturing and Wisconsin jobs. She introduced "Buy American" legislation to help rebuild our drinking-water infrastructure with American-made iron and steel. She co-chairs a bipartisan caucus to promote workforce readiness, job training and apprenticeships. The Wisconsin AFL-CIO has done the research and encourages you to vote to re-elect Tammy Baldwin as our U.S. Senator on Tuesday, November 6. Help us educate our fellow union members on Senator Baldwin’s record and all our endorsed candidates, join us as we knock doors and make phone calls this weekend with our Labor 2018 program. Early voting is underway in Wisconsin. You can now cast an in-person absentee ballot for the November 6 elections at your local municipal clerk's office. Make Sure You’re Registered: You can register to vote at your local municipal clerk's office until the close of business on Friday, Nov. 2. You can also register to vote at your polling place on election day. You must provide proof of residence such as a valid driver's license, utility bill, pay stub, or residential lease agreement. More proof of residence documents can be found here. Know your Candidates: The Wisconsin AFL-CIO is supporting candidates who will support working families by restoring collective bargaining rights, raising wages, making healthcare more affordable and investing in our schools and infrastructure. Click here to view a list of statewide endorsed candidates up and down the ballot. November 6 is just around the corner. We need YOU to volunteer today to help turn out the vote for working families. Union members are having conversations in the workplace, talking to Wisconsin voters on the phones and on front porch steps across the state in support of political candidates who will support worker rights. Labor 2018 phone bank and canvass opportunities can be found here. Grab a friend and a walk packet this weekend. Your efforts will be the difference on election day. We’re supporting candidates like Tony Evers for Governor, Tammy Baldwin for Senate, Josh Kaul for Attorney General, Sarah Godlewski for State Treasurer, and many more worker-friendly candidates in Congress and the state Senate and Assembly. View all Wisconsin AFL-CIO endorsed candidates. We are working to rewrite the rules of the economy to favor working people. In order to do that, we need to elect leaders who will raise wages, create jobs, repair our roads and bridges and invest in education. We need leaders who will support fair overtime pay, improved workplace safety and respect the rights of workers. See you at Labor 2018 election opportunities this weekend as we work to elect leaders who share the same vision for a better Wisconsin. 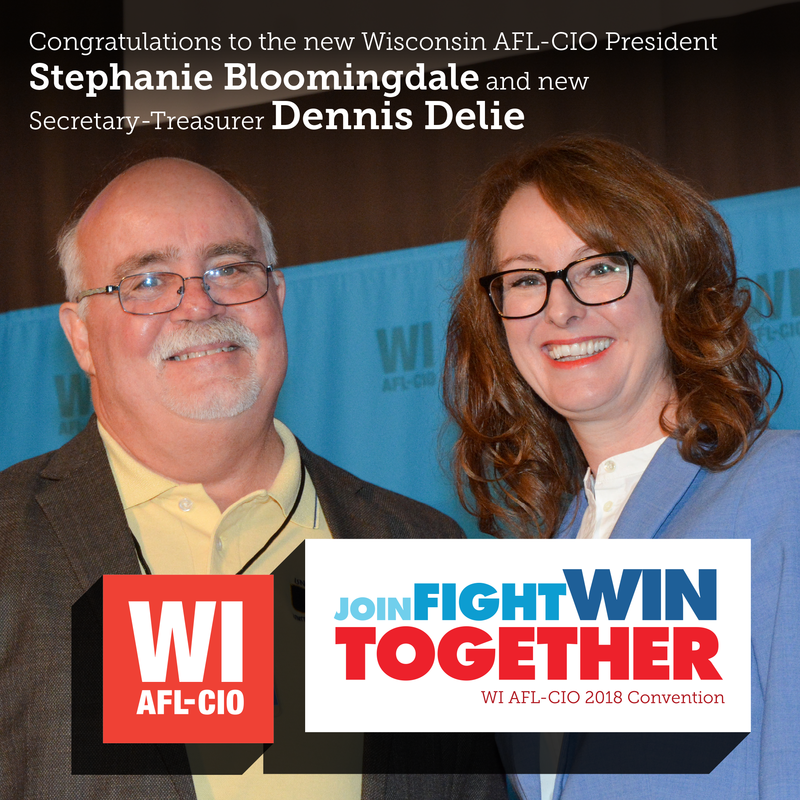 Stephanie Bloomingdale, WFNHP-AFT, has been elected by the delegates of the 30th Biennial Convention as the next President of the Wisconsin State AFL-CIO. Also elected were Dennis Delie, United Steelworkers 2-213, as Secretary-Treasurer, and members of the Wisconsin AFL-CIO Executive Board. Bloomingdale previously served as Secretary-Treasurer of the Wisconsin AFL-CIO for two terms, and before that worked as Director of Public Policy at the Wisconsin Federation of Nurses & Health Professionals - AFT. She has been an effective organizer, expert lobbyist, tough negotiator, and electoral mobilizer in the labor movement for almost three decades. Bloomingdale is the first woman to be elected President of the Wisconsin AFL-CIO. In her acceptance speech, Bloomingdale highlighted the convention theme of Join… Fight… Win… Together. She promoted innovative organizing and solidarity for all working people, and described how the union movement will draw on past successes to build a stronger future. The officers and board members are working to ensure that every worker in Wisconsin has the freedom to join a strong union for a better paycheck, a safer workplace, and a better life. Secretary-Treasurer Dennis Delie is a former President of USW Local 2-213. He is a workplace safety trainer expert who has assessed training requirements and developed and delivered training methods to match the needs of workers throughout the state and nation. He has served as President, Treasurer, Bargaining Committee Representative and shop steward of USW Local 2-213. Postal workers rallied in every single Congressional District in Wisconsin on Monday to stand up against privatization efforts at USPS. In Janesville, Madison, Eau Claire, Milwaukee, Brookfield, Fond du Lac, Superior and Green Bay working people came together to tell their Representatives we believe in a strong postal service and are saying no to privatization efforts. In Milwaukee outride Rep. Gwen Moore’s downtown office, Jeff Worden, APWU Local 3, explained why this issue is important to every American. American businesses, especially millions of small- and medium-sized businesses that send and receive products, invoices, payments and advertisements through the mail. American consumers, who increasingly rely on e-commerce to satisfy their essential needs, such as prescription drugs, weekly newspapers and magazines, and other mail order and online purchases. Those in rural and lower-income urban areas, would face soaring delivery costs on these items. Jobs and the economy. USPS is the centerpiece of the $1.3 trillion national mailing industry, which employs 7 million Americans in the private sector, many of them in your state. Postal jobs would be at stake, including the 1 in 4 employee who is a military veteran.